We will depart from our pick-up point in London early in the morning and you will sit back and relax in our comfortable and luxurious coach till we reach our first destination which will be Sri Venkateswara Balaji Temple in Birmingham. Here you will have the privilege for performing your prayers. After that we will depart towards the north where you will be able to enjoy the scenic views and capture the panoramic stills on to your cameras whilst we are travelling to the Lake District. At the Lake District we will visit the Windermere Lake which is England’s largest fresh water Lake. Here you will have the chance of either going on to the cruise or hiring the power boat to have a thrilling experience of the lake. You will also have some time to visit the town. You will then return to the coach and we will depart for Glasgow (Scotland). We will travel via one of the most scenic and beautiful route which will give us a chance to view the Kirkstone Pass which is a mountain pass in the Lake District having an altitude of 1,489 feet (454 m) and Ullswater Lake which is the second largest lake in English Lake District and it will accompany us for approximately 14.5 kms. We will then join the motorway to reach Glasgow via Gretna Green. Gretna Green is a village in the south of Scotland famous for runaway weddings. It is in Dumfries and Galloway, near the mouth of the River Esk and was historically the first village in Scotland.. On the arrival at Glasgow, We will stop at the city centre which is the heart of Glasgow. It consists of Glasgow Cathedral, City Chambers and the famous St. Georges Square. After the wonderful journey of our first day and knowing each other very well we will head for our dinner at Indian restaurant where there will be irresistible and delicious meal waiting for you. Once we will have our dinner, we will reach our hotel where you will have a relaxing night stay and make yourselves prepared for the next day attractions. After early breakfast we will depart towards Highland to view the magnificient mountains and lake scenery. On the way our first stop will be at Loch Lomond, one of the prettiest and largest Lochs in the whole of Scotland. 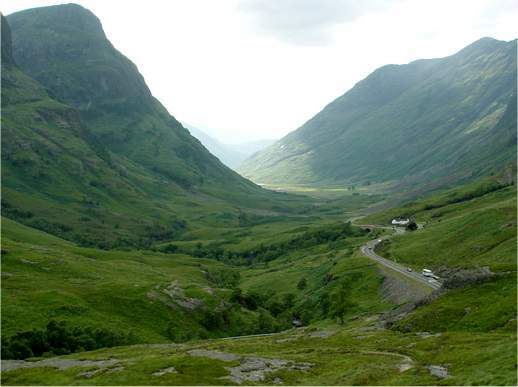 We then visit the infamous site of the 1692 Glencoe massacre one of the most famous Glens,where we pause for a photo-stop and to soak up the atmosphere in that haunting Glen, followed by a short drive to Fort William in the shadow of Britains highest mountain ~ Ben Nevis, where we stop for lunch. Travelling on, we admire the Caledonian Canal and the pretty village of Fort Augustus, enjoying the spectacular view of Loch Ness. It is 24 miles long and over 700 ft deep, is most famous for its sightings of the Loch Ness Monster, affectionately known as Nessie. At early morning, after our breakfast we will make our check out at the hotel and depart for the capital city of Scotland - Edinburgh! As it says the name is enough, everyone knows that Edinburgh is the most historical town of Scotland. Here you will have the opportunity to explore the city from the comfort of your luxurious seat and later on you will be given the free time to explore the city at your own pace. We will cover Calton Hill, National monument of Scotland , Nelson Monument, Scott Monument, Scottish National Galary, Edinburgh Castle, St. Giles Cathedral, Royal Mile, Scottish Parliament and the Hollyrood Palace. After enjoying the most popular city we will help ourselves for the Lunch and depart towards London. Upon arrival at London We will bid farewell to each other and hoping to see each other soon again. EAST HAM – 4.45am OUT SIDE EAST HAM STATION, HIGH STREET NORTH, E6 2JA. WEMBLEY – 5.45am OUT SIDE SANATAN HINDU MANDIR, EALING ROAD, WEMBLEY, HA0 4TA. HOUNSLOW – 6.00am OUTSIDE HOUNSLOW CENTRAL STATION, TW3 1JG. WARWICK SERVICES – 7.15am WARWICH SERVICES M40 NORTH BOUND, BANBURY ROAD, ASHORNE, WARWICK, CV35 0AA. KNAUTSFORD SERVICES – 10.30am KNAUTSFORD SERVICES M6, BETWEEN JUNCTION 18 & 19, KNAUTSFORD, WA16 0TL. Child aged 3-14 must share a room with 2/3 adults.